My name is Kristen, and I am a Southern Californian who has called Austria home since 2007 and Vienna home since 2008. This blog will highlight the best of my dining adventures in and around Vienna. 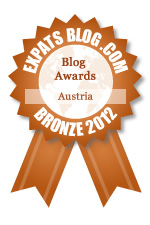 ExpatsBlog.com Expat Blog Awards 2012: Austria Bronze Award! This blog won the Bronze Award for best expat blog in Austria! We miss your expertise and humor Sushi and Struedel, thank you for making hip Vienna accessible to your fans and newbies. Your Name Do you think this blog has what it takes to be listed at the top of Expats in Austria Blogs?